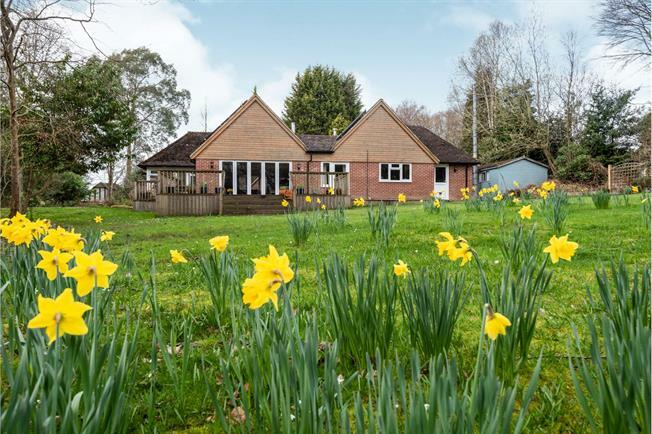 4 Bedroom Detached Bungalow For Sale in Heathfield for Guide Price £800,000. A rare opportunity to acquire this fantastic, very well appointed and very spacious, four bedroom, three bathroom, three reception room detached bungalow situated in a highly sought after country lane. Benefitting from a large driveway as well as garaging for three vehicles and a beautiful plot measuring approximately an acre, backing on to Darch's Wood. Extended approximately 7 years ago, this spacious property has been substantially improved to include a new kitchen, new bathrooms, re-wiring, re-plumbing, new boiler, the addition of wood burning stoves and the erection of a double oak-fronted car barn. A particular feature of the property is the level access making it very accessible and safe for the elderly & disabled or young children. The property is highly efficient and features solar PV and solar thermal panels, attracting significant FIT payments. The boiler is oil-fired, with LPG cylinders supplying gas for the cooker hob. A benefit for a property in such a rural location is mains drainage.